I’m starting to question my choice of posting all the linkable practice puzzles before the corresponding WPC review post… This is a great take on the standard Domino dissection puzzle that keeps the core while making it logically richer and less susceptible to uniqueness deductions. 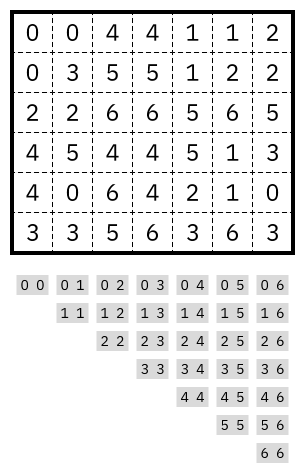 Rules Partition the grid into areas of size three, such that each domino can be placed within one of the areas. This entry was posted in Puzzles and tagged condensed domino, domino, wpc on 2018-11-14 by rob.